OroHYIP 6.4 is the latest version of orohyip script, this script is simply blows up the competition out of the water. Sure, we have what the other guys have: Autowithdrawal and Masspay support for more than 5 e-currencies, multi-level referral system, and unlimited investment and payout plans. 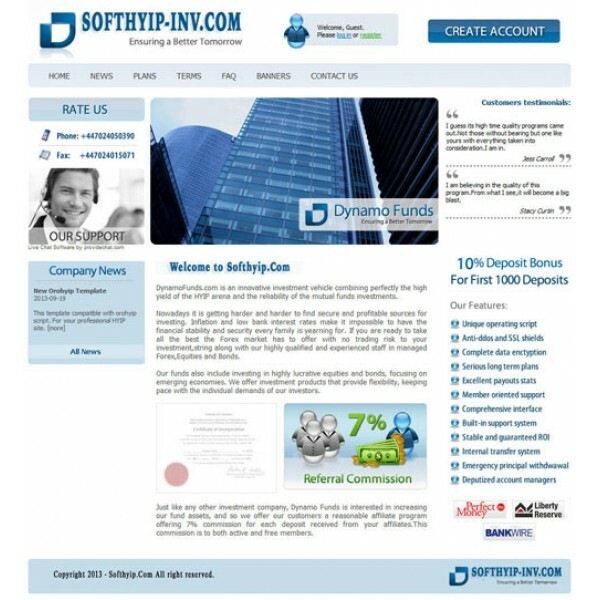 We have some features that you will only find in our script, such as hourly payment programs, cutting edge RIA DHTML user interface, professional looking templates (with flash), and many other features that set our script appart. We are currently focused in developing software for e-metals management, such as E-Gold, Pecunix, E-Bullion, 1mdc and others. Support : Liberty Reserve, V-Money, Perfectmoney, Altergold, c-gold, Igolds, AlertPay, SolidTrusPay,etc. Multiple Language.